RootsMagic Blog » Win an iPad in the RootsMagic 2012 RootsTech Treasure Hunt! 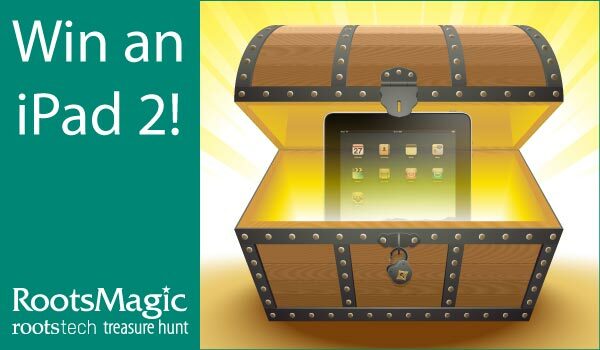 Win an iPad in the RootsMagic 2012 RootsTech Treasure Hunt! It’s been a tremendous last few months here at RootsMagic. We’ve been busy with the new releases of Personal Historian 2 and RootsMagic 5. We’re also excited to participate in one of the largest genealogy events in North America- RootsTech! Once you’ve collected the clues there are two ways to enter. The first is at the RootsTech conference itself. Pick up an entry card at the RootsMagic booth (#224) in the Exhibit Hall. Write the clue words on the back of the card and return it to the RootsMagic booth in the Exhibit Hall by Saturday, February 4 at 1:20 pm. At that time, we will hold the prize drawings. You must be present to win. We didn’t want those who aren’t able to attend RootsTech in person to feel left out so we’re holding a second drawing and giving away more prizes including a second iPad 2. To enter this drawing, visit http://www.rootsmagic.com/treasure anytime between Thursday, February 2 and midnight MST on Wednesday, February 8, 2012. Fill out the online form to be entered into the second drawing. You may enter both drawings but one entry per person, per drawing. Winners will be picked at random and notified via e-mail by Friday, February 10, 2012. Coming soon: You could win an iPad from RootsMagic! Your text expert lady in Salt Lake is a super whiz. Thanks for your help. Sounds like a lot of fun. I remember the old days of Family Origins under DOS — as the saying goes, you’ve come a long way, baby! Sounds like fun. Can we not visit the blogs before the contest begins? Appreciate your new county list for MA. Very helpful as towns and counties changed many times before the current ones. Makes for much more accuracy. Ive Just finalized two complete families and included many photos of each family, now to get copies made to send to the relatives. I’m sure they will be thrilled with the Roots Magic ability to produce such beautiful famiy keep sakes. Many,many thanks to the Masters who produced this program. I am loving the new Roots Magic 5! The treasure hunt was a lot of fun and introduced me to new websites that I hadn’t seen before. I enjoy using Roots Magic to save all of the family history I am gathering. You continue to do good work. I began by using Family Origins Version 3 and have continued to the current version. One of the applications that has become very useful is the Descendants Listing. I joined Facebook as a place to connect with the rest of my family. I used the Descendants list to begin my quest of getting as many family members connected. Currently, there are over 80 members in the Group called “Those With Morrison Roots.” We are all expecting our next addition in May of this year. Thank you again for the wonderful product – I do continue to recommend it. How cute your contest is. Thank you for the opportunity. Of course I hope I win, I pray I win but was fun no matter what. Have a great week. Am just starting to enter information on a genealogy software; my Mother has a tremendous amt. of history that I want to get on a program. You had the best reviews for a novice so decided on Rootsmagic. Thanks. Started with you with Family Origins or was there one before that? You helped us when we crashed and saved our 5000 + names. Tex & I have watched you grow in many ways as we just got older. Love your product! See you at BYU one of these days. It has taken me a while to get to this point and I need all the helps I can get to learn the system. I appreciate all the help and comments that I read.